I find it so amazing the way the brain can take you off in so many different directions when starting a new design. I had found the Stamptacular Sunday Challenge for 'Going in Circles' and thought I would like to use the shape in a new design. So having seen the great examples from the DT, I started to collect bits together, 2 pieces of cream card cut into 5in circles, expecting to make a round card, plus a piece of dark brown paper with circles on which would lend itself nicely to a distressed look. I cut a nesties scalloped circle from it and a plain circle. Here we go, bits to start me off. Hey ho - not to be. I went off in a completely different direction and decided to experiment with a new Tim Holtz mask of a clock that I have just received. Using one of my pieces of cream circular cards I inked it using Antique Linen and Vintage Photo. Mmmmm, quite liked that. Ok what could I add to it? I remembered I had some TH clock faces, found those and chose one to use. I also found my Paper Artsy rubber stamp of a clock and thought - what else can I stamp with this? Out came the vintage car and vintage bicycle, great, wheels are round. I looked for other bits and pieces to go with it. Of course I had to have some flowers but I knew it shouldn't be too flowery so, I made a small rose using the brown paper with circles on. Oooh, I need some clock hands, but I don't have a die and nothing on my Cricut cartridges, so what else is there? I found a pack of Kanban adhesive hinges with a pointer that would do perfectly and a metal card holder in my TH bits and pieces. Wow getting somewhere. I then searched a box of K&Co embellishments and found the 'Time and Again' and chipboard circle. Loved the circle but how could I use it? Another paper flower using the technique I have just learned, tearing different sized circles - that fits well. In my vintage brad box I found a great round one that I mounted on a spot cut from the brown paper. I cut a circle from an old book and inked it. I knew I had some clock paper somewhere so I found that and whilst I was waiting for all the Stickles and glitter glues to dry I cut and distressed the backing papers to go on the card and I made the sentiment using my Justrite Stampers set. Now it's complete you can see how different it is compared to my original ideas. Nothing like it in fact. Well that's how my brain led me and I'm still pleased with the effect and with what I have learned. 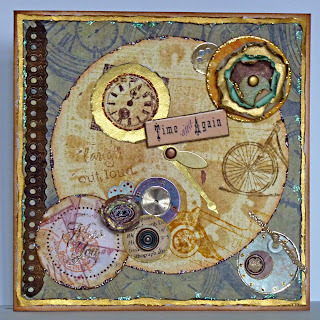 So now to enter it into the Stamptacular Sunday Challenge #46 - Going in Circles! Thankyou for looking and for all the lovely comments I have been receiving on my creations. Take a look at The Craft Barn website, they have a great range of goodies - I want to get to the shop when I can get to the other side of Surrey. Great work, I love the vintage feel. Thanks for joining us at SSC. LOL the joy of the journey always an advanture and interesting to see where you end up. This is fabulous a great result. Did you see we have a sponsor this week? The craft barn to be in with a chance to win a £15 voucher to spend there you need to add a link to them in your posting be a great shame to miss out. Thank you for getting messy with us at TT this week. Wow! This is stunning! Thanks for sharing with us at TT this week! Beautiful card. Great colours and details.